the West Fields area of Newbury. From 1912 they lived at Newark Villas (pictured) their home was on the right, now 33 Russell Road. Bob was born in Newbury in 1893, the youngest surviving child of George Taylor and his wife Maria née Pibworth. They had nine children in total, but only seven survived infancy; Bob’s siblings were: Minnie ( born 1877), John (1880), Frederick (1882), Frank (1885), Elizabeth (1887) and Ellen (1890). George was a joiner, employed by Elliott’s one of Newbury’s principal businesses; he was evidently a valued employee and was made a foreman. It is, therefore, little surprise that young Bob got a job with Elliott’s, but not on the shop floor with his dad, he worked ‘in the office’. This could cover a range of tasks from tea boy to draughtsman, accounts clerk to cleaner – however, it seems that Bob made a good start to his career before the war came. 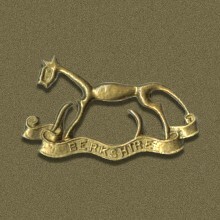 Berkshire Yeomanry cap badge depicting the Uffington White Horse. He enlisted early in the war, joining the local Territorial cavalry, the Berkshire Yeomanry in November 1914. He trained with the Yeomanry at Bearwood and became a Trooper in the 2/1st Berkshire Yeomanry. This was a 2nd Line Territorial cavalry regiment – the 1st Line comprising pre-war Territorials who volunteered to serve abroad when asked to do so in August 1914. The 2nd Line were a mix of those who did not volunteer and retained their right to serve in home defence alone (a right removed by the Military Service Act in 1916) and new recruits who needed training before they could be sent to a fighting unit. In September 1916 the 2nd Line Yeomanry units were each ordered to supply a draft of 160-200 men to serve as infantry in France, where many battalions were desperate for reinforcements. 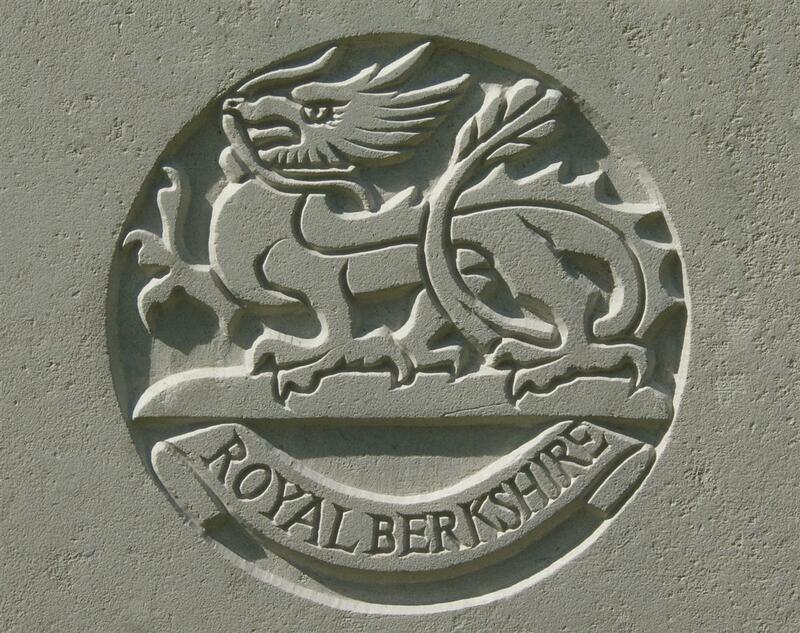 Bob was among the men selected from the 2/1st Berkshire Yeomanry. He was given a few days embarkation leave, kitted out as an infantryman and sent to France where the draft landed on 20 September. They were sent to an Infantry Base Depot were they were allocated to infantry battalions in the field. The men from the Berkshire Yeomanry were split up, some went to the 3rd Battalion Worcestershire Regiment and the rest (including Bob) went to the 2nd Battalion Berkshire Regiment. The draft arrived at the battalion on 1 October. TAYLOR – Nov 11, died of wounds received in action in France, Robert George (Bob), son of George Taylor, 1, Newark-villas, Russell-road, Newbury, aged 23 years. Pte Taylor joined the Berks Yeomanry in November, 1914, and was trained at Bearwood. He had been in the war zone for barely three months, being attached to the headquarters of a Berks battalion. The only intimation of how he met his death was the customary notice from the War Office, stating that he died of wounds received in action on November 11th. Mr and Mrs Taylor have two other sons on service, Fred in the RNAS, and Frank in the Australian contingent now in training. 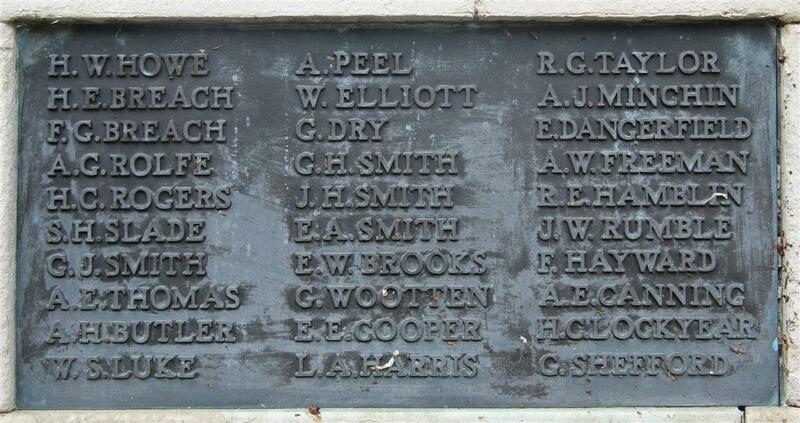 The deceased, Robert, was in the office at Messrs Elliot’s Ltd, prior to enlistment. The chaplain’s account is typical of letters from the front to the relatives of a dead comrade; the inference being that Bob died painlessly while doing his duty. The war office notification that he ‘died of wounds received in action’ suggests a significant delay between his wounding and his death; during this time he may have been unconscious – or he may have undergone considerable pain and suffering. He was buried in grave X. 4 at Carnoy Military Cemetery, close to the site of a Field Ambulance (despite the name a frontline hospital facility) where Bob would have been brought following his wounding. Sadly the battalion’s war diary does not shed any light on Bob’s demise; only one casualty is reported on 11 November, a wounded 2nd Lieutenant. However, Bob died close to the front line, almost certainly within hours of being wounded – it seems that the war diarist failed to record his wounding or death. Locally he is remembered on Tablet 10 of the Newbury Town War Memorial, and also on the roll of honour and memorial board in St Nicolas’ Church. He was also remembered by Elliott’s, his name was on the brass plate attached to the litany desk, made and carved by joiners at Elliott’s (perhaps in part by his father) and presented to St Nicolas’ Church in commemoration of the five employees who died during the war. In 1915 Bob’s sister, Ellen, married Percy Robert Styles; Percy was another who answered his country’s call with fatal consequences his story is told here. Another relative joined Bob and Percy on the Newbury Town War Memorial: Frank Pibworth was Bob’s second cousin (Frank’s father and Bob’s mother were first cousins). Freaderick Taylor was born on 22 February 1882, like his youngest brother he too followed his father’s trade and became a carpenter and joiner. In 1909 he married Lily Elizabeth Davis with whom he had at least three children: Ronald Frederick (16 January 1911), Robert George (31 January 1917), Joan Elizabeth (3 January 1919). The latter two may well indicate when Fred got leave! It is also notable that the loss of Bob in 1916 was also commemorated in 1917 when Fred and Lily named their son after him. As a carpenter Fred has skills that were of particular value to a new branch of the Royal Navy – the Royal Naval Air Service - aircraft were largely built of wood and canvas. Fred joined the RNAS on 3 May 1916; this was an odd time to enlist, his age (34) and marital status means he would not yet have been conscripted, so the odds are that he enlisted under the Group or Derby Scheme in late 1915. This scheme encouraged men to enlist for future service as needed; by that time everyone knew conscription was coming and the Derby Scheme had the advantage of being a last opportunity to choose which regiment or service you would serve in (a choice that was often, but not always accepted by the services). Fred’s carpentry skills may well have led to the RNAS taking him, regardless of his wishes, or he may have expressed a wish to work with aircraft. Despite the Naval aspect of the RNAS the service sent land based squadrons to France one of which was joined by Fred in June 1916. On 1 April 1918 the Royal Air Force was created, bringing together the RNAS and its Army equivalent, the Royal Flying Corps. In October 1918 Fred was posted to Joyce Green airfield in Kent from with he was posted in February 1919 to the Discharge Centre at Chiseldon. While it would seem that he would be discharged soon after it was not until 30 April 1920 that he was ‘deemed discharged’. This almost certainly means that he was discharged to what was known as the Class G Reserve and was sent home to civilian life with an ongoing commitment to return should fighting break out again. The Class G Reserve was disbanded on 30 April 1920. Frank Taylor served in the Army in France, but in the Australian Infantry Force (AIF). Whilst the Australian troops were an integral part of the British Army they were subject to slightly different controls. For instance, when the UK brigades of the BEF were reduced from four battalions to three in late 1917 the Australians and Canadians retained the four battalion system. This helped them stand out in the fighting during 1918 and was partly responsible for the elite unit reputation they gained. Frank was living with his wife, Martha, in Cooper Plains near Brisbane when he enlisted on 29 February 1916. He too was a carpenter, but, unlike Fred, this had no impact on his postings. He served in France with the 25th Battalion, AIF. His record shows no evidence of wounds, but he was hospitalised with both chilblains and syphilis. He was discharged on 15 June 1919. 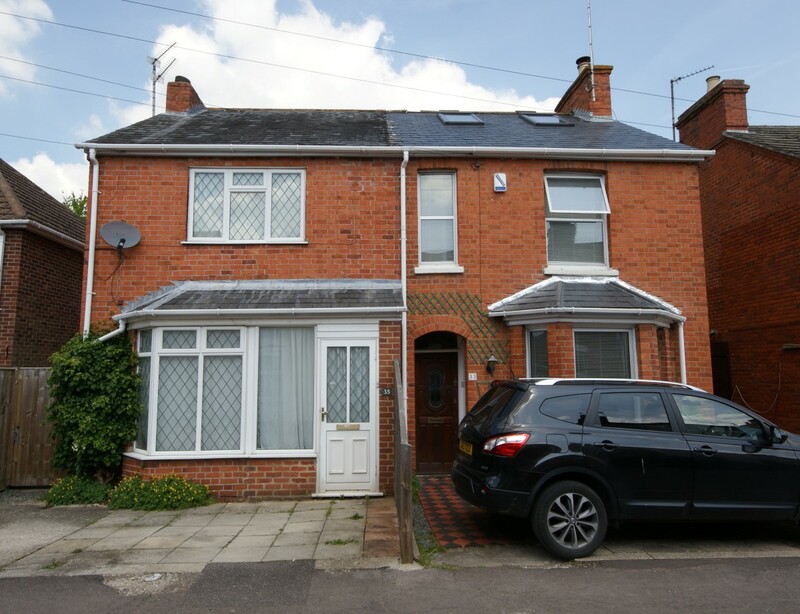 It is quite possible that the fourth brother, John Taylor (another joiner), also served – but no identifiable trace of his service has been uncovered.